Hello and welcome to another Watercooler Wednesday Challenge. 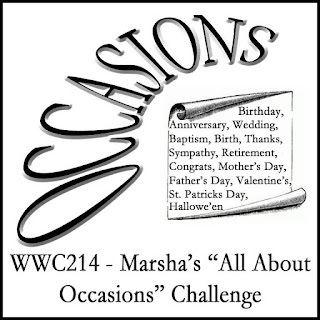 This week I'm hosting our "All About Occasions" challenge. The card I'm sharing is one I made in the local stamp group I attend each month. Since March is my birthday month, what better way to celebrate than with some bright, cheerful balloons. For all of our challenge details and to share your project, visit the Watercooler Wednesday Challenge by clicking the image below. We’d love to have you join us. You have until Monday, April 1st at 4:00 p.m. Pacific Daylight Time to link up your project. Thanks for visiting today and I look forward to seeing you again at the Coffee Pot Stamping Cafe. 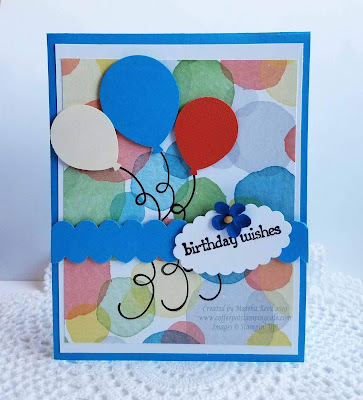 Love how bright and fun your card is Marsha - Happy Birthday wishes to you. Happy birthday Marsha! I love the balloons against that colourful background. Thanks, Mac! I did have a great one. A wonderfully bright happy card, Marsha! Love the balloons on this background!